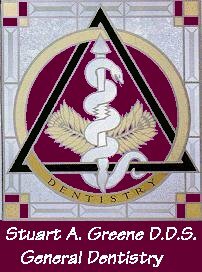 Stuart A. Greene D.D.S., F.A.G.D. Do you like your smile? Do you have teeth that are chipped, cracked or discolored? Do you hate those old gray silver fillings? Cosmetic dentistry and a "dental makeover" can make it easy to smile again. Porcelain laminates, onlays & inlays and crowns. Porcelain fused to metal crowns and bridges. With over thirty years of clinical experience worldwide, titanium implants have proven to be ideal replacements for missing teeth in many patients. Our office works in association with board certified maxillofacial surgeons and periodontists to assure successful oral rehabilitation of our patients. We will process all insurance claims. As a service to our patients, we are pleased to offer the CareCredit card, North America's leading patient payment program. CareCredit has a full range of payment plans to meet every financing need, including no interest* and low interest* options, each with low monthly payments and no upfront costs. It's easy to apply and you'll receive an online decision in seconds. Apply now or see our staff for more details.